Baby hungry mouth to feed. The sun is setting, and the weary tawny eagle continues to soar and search over the vast Serengeti Plain. He has been hunting all day, and he will not stop until he finds food for his young chick. As the sky darkens and nighttime approaches, predators and prey emerge on the land below. Hippos lounge, cobras slither, lions prowl, zebras gallop, rhinos graze, dik-diks scurry and still the eagle searches. 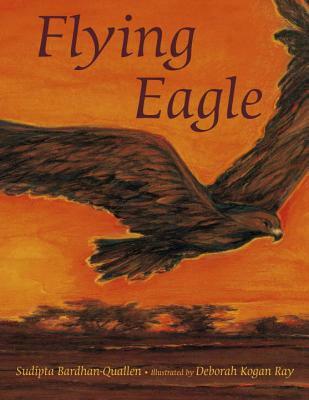 Poetic text and stunning illustrations depict a father tawny eagle on his evening flight. Back matter provides additional information about the tawny eagle and the Serengeti Plain. FLYING EAGLE is an intriguing introduction to the African landscape of the Serengeti, which is rich in wildlife but in danger of being damaged by poachers. Sudipta Bardhan-Quallen is the author of several books, including THE MINE-O-SAUR (Putnam) and TIGHTROPE POPPY THE HIGHWIRE PIG (Sterling). She lives in South Orange, New Jersey.